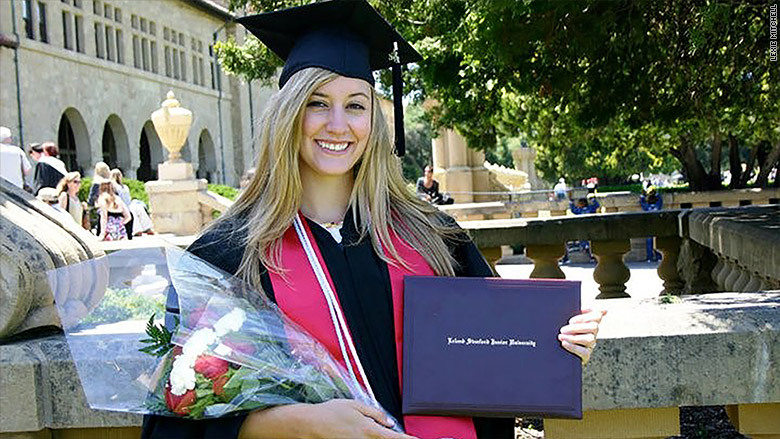 Lexie Mitchell refinanced her student loans about four years after graduating from Stanford. Looking for an easy way to reduce your student loan debt? Lexie Mitchell, a 2011 Stanford grad, found one. By refinancing her student loans, she cut her monthly payments by $80 and will save a whopping $20,000 in total. "Stanford was amazing. I loved it, but it's also very expensive," Mitchell said. She went to school on a scholarship for track and field, but didn't compete all four years. She lost the scholarship and had to pick up the tab to finish school. Refinancing student loans hasn't always been an option. As recently as a few years ago, it was difficult for grads to find a bank that would offer them a better rate. But the tide has turned. About half of those with outstanding student debt could save money by refinancing, according to Citizens Bank, one of the biggest lenders in the space. Mitchell did her research and found that an online lender called SoFi offered her the best deal. She lowered her interest rate to 6.4% from 10% on a 20-year loan. Most lenders don't charge an origination or closing fee, so there's a little risk. "If you're confident you can afford the monthly payments, it is very hard to find a downside," said Douglas Boneparth, a CFP that specializes in advising Millennials. It may sound too good to be true, but here's why it works. The new rate is based on your credit score and your income. So if you've found a good-paying job, it makes sense that you can get a lower rate than when you were in college, said Brendan Coughlin, the president of consumer lending at Citizens. Mitchell waited until she got a bump in pay to refinance, which scored her an even lower rate than she might have otherwise gotten. "Refinancing isn't for everyone. But higher-income individuals can really take advantage for some pretty low interest rates," said Andy Tate, a CFP who's helped many doctors and lawyers refinance. The average person refinancing at Citizens is 33 years old, earns $75,000, and has about $45,000 in loan debt. If you don't fit that mold, it doesn't mean you're out of luck. You can find out if you're eligible with most lenders by inputting some information online, for free. It took Mitchell about an hour to get a quote from SoFi. It's worth looking into now. Rates are low, but could eventually creep higher after the Federal Reserve decides to implement a hike. "We're at a period of time when customers are likely to get the best deal they'll see in a while," Coughlin said. If figuring it out sounds like a terrible way to spend a Saturday afternoon, here are some tips to make the process less painful. Check out Citizens, SoFi, Earnest, Darien Rowayton Bank, LendKey, and CommonBond. Those are the biggest players in the space and each may make you a different offer. Some require you to have completed your degree while others don't. Some require that you open a savings account in order to refinance. The lowest rate may not be your best option. Some offer different terms. A 5-year loan may come with a lower rate than a 15-year loan. But both could save you money over the long-run. You can refinance both federal and private loans. While private loans typically come with a higher interest rate to begin with, don't rule out your federal loans. If you borrowed from the government before 2008 for undergrad, or at all for graduate school, it's likely you're paying an interest rate at or above 6%. Federal Parent PLUS loans, which come with an even higher interest rate, are also eligible for refinancing. If you refinance a federal loan, you'll be giving up some protections, like applying for forbearance, deferment, or income-based repayment. If your finances takes a hit in the future, you might not be offered these benefits. Refinancing is different than consolidating. Consolidating is a great when you have a ton of different loans and want to make just one payment. The new interest rate will be the average of your prior loan rates. But refinancing puts your loans together in one spot and saves you some money by reducing your rate. Now that Mitchell refinanced, she and her husband are more comfortable making big financial decisions, like their upcoming move to New York City. "For us, it's really nice to have that extra $80 a month in our back pocket. You never know when things will get tight," she said.